If you haven't joined the SSD revolution yet, today's a good day to jump in with these deals at Newegg. If there's one constant in the world of PCs, it's that there's no better upgrade than swapping a hard drive for a speedier SSD. And today, there are two deals from Newegg for varying budgets to bring the speed of an SSD to your PC. The first is one is a 525GB M.2 Crucial MX300 for $109. This is a close cousin of our favorite budget SSD the Crucial BX300. Act fast though, since the M.2 MX300 is not that easy to find these days. Amazon, for example, has some resellers offering used versions of this drive for $122, and other online retailers are selling new versions for far more. This particular MX300 is of the M.2 2280 SATA III variety, meaning you'll need the right kind of slot on your motherboard for it to work. Crucial says this SSD is more than 90 times more energy efficient than a hard drive and is dramatically faster. 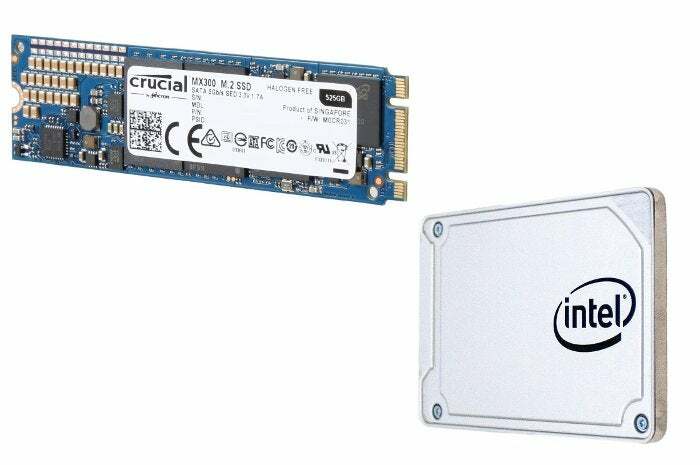 If a $100 SSD isn't to your liking or you can't run an M.2 drive, try an Intel 545s 256GB 2.5-inch SSD for $65. That's about $18 cheaper than you'll find elsewhere. We reviewed the Intel 545s last July and really liked it for its ability to write large data sets without slowing down. Plus it comes with a 5-year warranty. And don't scoff at the 256GB capacity. Desktop PC users can always use the SSD as a boot drive and then store the rest of your files on a slower spinning hard drive.